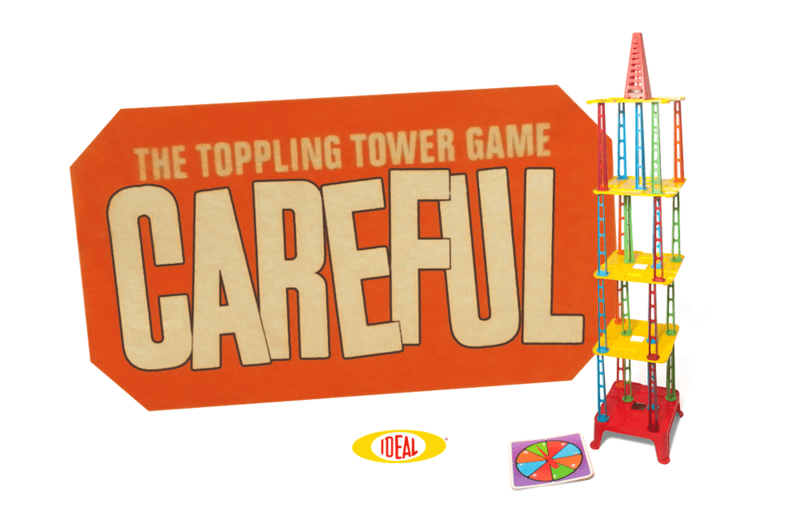 Designed by Marvin Glass & Associates and released in 1967 by Ideal, Careful The Toppling Tower Game requires “steady nerves and steady hands” to win. Setting up Careful is almost as fun as playing it, beginning by constructing a 5-foot tall tower. To start the game setup, a red plastic base is placed on a level surface. A series of 5 levels is then added one on top of the other, using the brightly colored plastic support pillars and floors provided. Careful puts the kibosh on any arm-chair architectural engineers by imprinting each floor with six colored “identification circles” that dictate the placement of the various support posts. The top floor is finished off with a red plastic bell tower placed in the center. Careful is played in a series of rounds corresponding to the number of players playing. A different player starts each round and everyone takes turns spinning the spinner and removing a pillar in the color group they spin. Players may choose a piece in that colour from any floor of the tower. Careful allows for a variety of strategies to be used to successfully complete a turn. Pillars may be removed in any way possible, including sliding them along the channels cut into the floor, tipping them, and pushing them into the center hole in each floor. For the bold, pillars may also be moved within and between floors. A player’s free hand may also be used to hold, lift, or tilt individual floors. Regardless of the strategy employed, the bell tower at the top gives an audio cue when the tower becomes unstable. Each round continues until the tower falls. The last player who touched the tower before toppling it receives no points, and the remaining players receive points based on the number and color of the pillars they have removed. The player with the most points is declared the winner. Released in 1969, each tool was a working metal and plastic replica of the electric-powered tools kids might have seen on the workbench at home in the garage or basement.